Raiders scoring: Sam Plant - 3 goals, Gez Evans - 1 goal, 2 assist, Adam Jenkins - 1 goal, Owen Tennant & Elizabeth Wright 1 assist each. 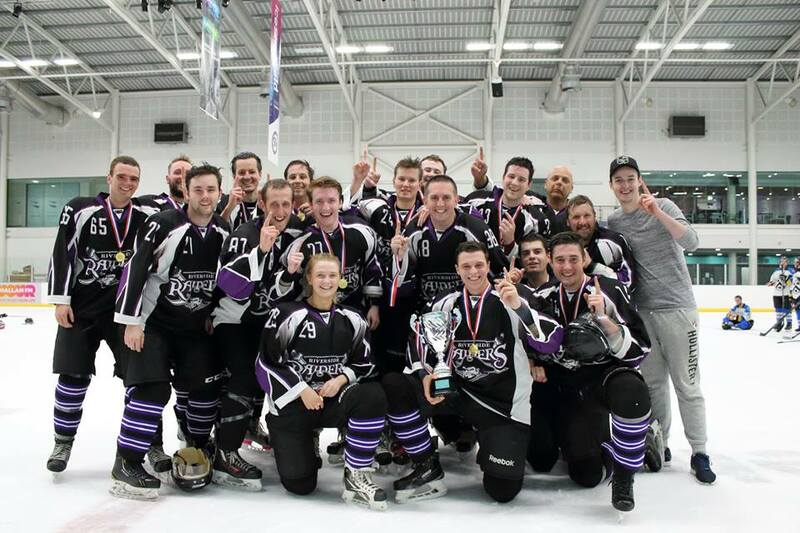 The Widnes-based Riverside Raiders ice hockey team won their first ever piece of silverware at the weekend when they beat Grimsby Stormers 5-3 in the Puckstop Summer Classic Play Off trophy final at iceSheffield. The Raiders had progressed from a 5-team qualifying group and then beat the Wyre Seagulls in the semi-final to get to the final where they took on the team from Lincolnshire. They took the lead in the 12th minute of the game with a goal from Sam Plant and were 2-0 up at the end of the first period after a 16th minute strike by Adam Jenkins doubled their lead. The Stormers were quickest out of the blocks in the second period and pulled a goal back just 3 minutes from the restart through Lubo Svatojansky. Sam Plant hit back for the Raiders just 2 minutes later to restore the two goal advantage but another Grimsby goal at the half way mark (Clark) kept the league champions in contention. Sam Plant’s third goal of the game came just 30 seconds later to calm Raiders’ nerves and then a goal from Gez Evans towards the end of the period left the scoreline looking much healthier from a Raiders point of view at 2-5 after 40 minutes of play. The Stormers struck again just 3 minutes into the 3rd period to pull the score back to 3-5 and there followed an incredibly tense phase of Grimsby pressure and Raiders defence. 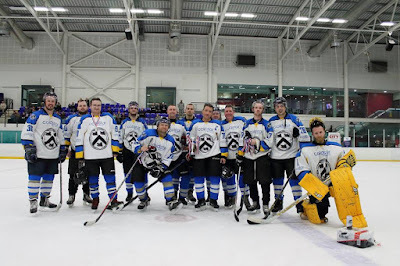 In their enthusiasm to mount a late challenge, the Stormers picked up a raft of penalties in the last period which effectively put an end to their chances and the Raiders played a solid defensive game to close thing down until the final buzzer. 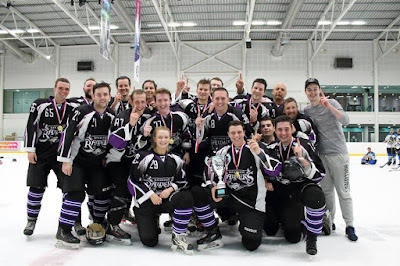 The playoff win was a fitting reward for the Raiders players and supporters who had played well throughout this competition and only missed out on the league title on goal difference after finishing level with Grimsby on points in the group table. Adam Jenkins, Adam Murphy, Anthony Hughes, Ben Donkin, Charlie Perry (NM), Eemeli Vuourihovi, Elizabeth Wright, Gez Evans, Howard Hughes, Josh Birtwistle, Mike Teinert, Nick Jackson, Owen Tennant, Peter O’Mahony, Sam Plant, Stephen Harvey.